FORT WORTH, Texas (Oct. 3, 2017) – After leading Washington State past No. 5 USC on Friday night, Luke Falk has been voted the Davey O’Brien Quarterback of the Week for the second time in his career. Falk finished the 30-27 victory over the Trojans by completing 34-of-51 passes for 340 yards and two touchdowns. During the contest, the senior became the Pac-12 Conference’s all-time career completions leader (1,211) and moved into second place on the league’s career list for passing touchdowns (105). On the year, Falk leads the country in completions per game (32.8) and ranks tied for second in touchdown passes (16). In addition, he sits fourth in completion percentage (.745), fifth in passing yards (1,718), fifth in points responsible for (96) and 12th in total offense per game (333.6). 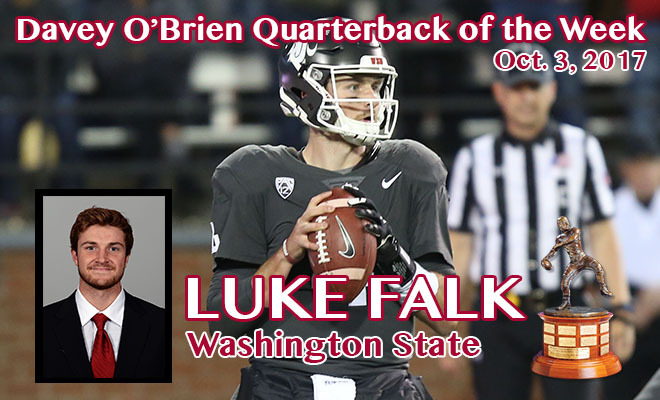 Falk was previously named the Davey O’Brien Quarterback of the Week on Nov. 9, 2016. The native of Logan, Utah, has been a semifinalist for the National Quarterback Award each of the past two seasons. The other “Great 8” quarterbacks in week five were: Zach Abey of Navy, Pitt’s Max Browne, Jake Browning of Washington, Clemson’s Kelly Bryant, Ben Hicks of SMU, Oklahoma State’s Mason Rudolph and Nick Stevens of Colorado State.